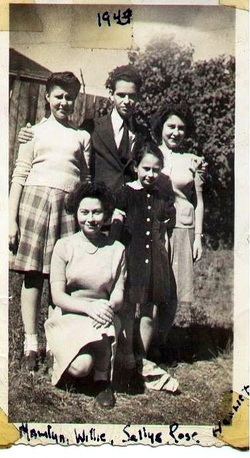 After a stay in New York city with their Aunt Gruna, the three Kramer siblings, Meyer, Barney and Esther, were sent to the Kramer farm in Plymouth Connecticut where newly arrived family members were acclimated to the English language and the American culture. After their stay in Plymouth, a very small town, they moved to Waterbury Connecticut, a much larger city. Family members told me that my grandfather Meyer was a multilingual and scholarly man who was a Yeshiva Bucher (student) in Eastern Europe. He could read and write Yiddish, Russian, and English. He may have wanted to become a Rabbi when he lived in Belarus. Three years after his arrival in this country, Meyer Kramer married my grandmother, Tillie (Tevel) Teitel Schaev, on June 25, 1916. He was 24 and she was 21 years old. I have heard from members of the family that the marriage was "arranged." The marriage lasted until Meyer's death in 1951. Meyer was employed by his older brother Barnet "Barney" Kramer who was in the junk business. He was evidently not happy about this and he was ashamed to be a junk man. His daughter, my late Aunt, Marilyn Kramer Savitt, told me that when the kids in school had to announce their father's profession, they were always embarrassed to admit they he was a junk man. My first cousin, David Katrosar, (son of Sallye Kramer Katrosar) told me that Meyer also delivered milk and his horse was named "Nellie." David, his oldest grandson, often rode on the milk wagon with him. During the depression, times were tough for Meyer,Tillie and their six children. The family lived in an apartment on Elizabeth Street in Waterbury. My father, Joseph Kramer, told me that the family never went hungry and never wanted. I remember visiting the apartment when I was very young. Many of Meyer and Tillie's children, my uncles and aunts remained in the Waterbury area their entire lives. These include my parents, Sallye and Joe Katrosar, Willie and Lois Kramer, and Harriet and Harry Meisel.